SALEM — In the wake of a new law enforcement report claiming that overproduction of cannabis remains a problem in Oregon, some state lawmakers say they'll continue to work on improving regulation and enforcement of the state's cannabis laws when they convene for a session next year. Meanwhile, the Oregon Liquor Control Commission (OLCC), which regulates recreational cannabis, said the report and the data it uses require more scrutiny. This week's report was authored by the Oregon-Idaho High Intensity Drug Trafficking Area, or HIDTA, program. HIDTA is a federal program that aims to coordinate law enforcement efforts between agencies and governments and to reduce illicit drug trafficking. The report appears to bolster claims by the U.S. Attorney for Oregon, Billy Williams, who has said the amount of cannabis produced in the Beaver State far exceeded the amount that Oregonians could reasonably consume and raises concerns about diversion of the product across state lines. Oregon's estimated annual production capacity exceeds 2 million pounds, "far outpacing annual state consumption demands," which range from 186,100 to 372,600 pounds, the report said. The report also pulls together a wide range of other data points, from cannabis-related emergency room visits to youth exposure to cannabis advertising. Oregonians voted to legalize recreational cannabis for adults 21 and older in 2014 via ballot measure. Since then, the Legislature has been working on ways to stand up the regulatory system for legal adult use. Oregonians voted to legalize medical marijuana in 1998. U.S. Attorney General Jeff Sessions rescinded Obama-era guidance on states with recreational cannabis earlier this year, leaving the issue up to the discretion of federal prosecutors in the states. An earlier version of the report authored by the Oregon State Police, obtained and published by The Oregonian last year, was decried as incomplete and inaccurate by Gov. Kate Brown, whose spokespeople last week did not respond to a request for comment on the new report. Senate Democratic Leader Ginny Burdick, of Portland, said that while she thinks the regulatory system has been well developed, enforcement is the next area to emphasize. In the most recent legislative session lawmakers created the Illegal Marijuana Market Enforcement Grant Program, which will offer $1.5 million per year for six years to local police to fight the illegal market. Burdick pointed favorably to the OLCC's temporary moratorium on new licenses, announced in June, and said Friday it may be time to consider limits on the number of licenses that can be issued. Oregon has no limits on the number of recreational marijuana licenses it can issue, and received a surge of applications after announcing the moratorium. She also supports removing cannabis from the list of controlled substances under the federal Controlled Substances Act. And she's not alone: in a sign of growing support for relaxing federal laws on marijuana, the National Conference of State Legislatures passed a directive this week calling for Congress to legalize cannabis. The directive prompted Burdick and two other state senators — Senate Republican Leader Jackie Winters, of Salem, and Sen. Elizabeth Steiner Hayward, of Beaverton — to issue statements in support. They say legalizing cannabis would allow the industry to enter the national banking system and avoid some of the perils of a system that is now almost entirely cash based. Sen. Floyd Prozanski (D-Eugene) said he has ideas about ways to improve regulations and licensing, but is keeping the specifics close to his vest for now. "I recognized that this was an issue in 2015," Prozanski said. "I still see this as an issue and some of this stuff is coming home to roost." He's already floated ways to tweak the law to deal with Oregon's cannabis bounty. In 2017, Prozanski sponsored a bill that would have allowed the governor to enter into agreements with states that have legalized marijuana and border Oregon so that the product could be legally transferred across state lines, but it didn't make it beyond the Senate Rules Committee. The OLCC, meanwhile, is preparing its own supply-and-demand study of the state-legal recreational market for lawmakers heading into the 2019 legislative session. The agency takes issue with some of the HIDTA report's data points — for example, the number of recreational marijuana producer licenses the report cites is about 1,000 more than the actual current number of producer licenses as of Aug. 1, said spokesman Mark Pettinger. "We need to figure out if there are other inaccuracies in the report," Pettinger said. He also said the report doesn't make enough of a distinction between the three sources of cannabis in the state: the regulated recreational market, the medical marijuana market and the illicit market. Pettinger said OLCC will have "a larger presence and more systemic enforcement" as the fall harvest season begins. 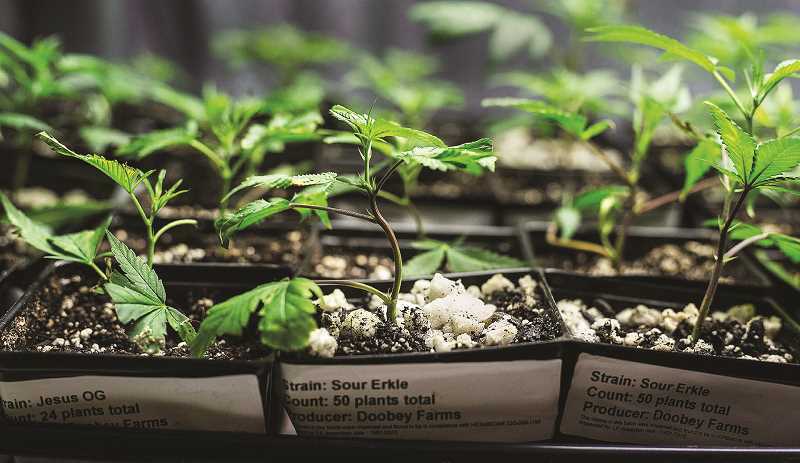 And hundreds of medical marijuana growers are being incorporated into a "seed-to-sale" tracking system called Metrc that was previously used just for recreational cannabis.